Summer is not quite over yet (100 degrees today, I hear) --- but the local housing market is already showing some signs of fall --- and that's a good thing! Typically our local housing inventory continues to increase through July before starting to decline heading into the fall. This year, however, we're seeing a decline in local housing inventory earlier than we typically do. Perhaps it is the result of more buyers making buying decisions. Perhaps fewer sellers are trying to sell. Whatever the reason, it is helping to (slowly but surely) bring more balance back to our local housing market. So yes, it is true that this is "the biggest month­ly jump in nearly a year" -- but put in context, it's not as terrible news as some might otherwise suspect. The bottom line here is that month by month analysis of local unemployment rates can cause you to have sudden mood swings. After all, last month we were celebrating a tie for the lowest unemployment levels in over a year.....and this month we're mourning a huge increase in unemployment. Who bought (or sold) what for how much? Looking for information about recent property transfers in Harrisonburg and Rockingham County? Be sure to check out HarrisonburgPropertyTransfers.com. Have you heard about Harrisonburg's Northend Greenway? It will be a 2.5-mile multi-use path connecting people in north Harrisonburg with the places they want to go. From Virginia Mennonite Retirement Community, to Section 8 housing, and a university, a high school, and two community centers, the path will serve several diverse populations, representing 10-20% of Harrisonburg residents. Commuters working or living in downtown and points north will have a scenic, stress-free, and significant segment of their ride off of roadways and along a relatively level route. People needing to buy groceries, attend events downtown, or athletics and plays at Eastern Mennonite University, will have an easy, relaxing way to get where they need to go. Others wanting to travel farther – to James Madison University, Purcell Park, etc. – will be able to easily connect with existing bike and pedestrian infrastructure to continue their journey. For many of the residents along the path's route, this will provide a sustainable and financially viable means of transportation. Beyond simply meeting transportation needs, the path will also be a "corridor park," that passes through neighborhoods and undeveloped land along a scenic route that follows Blacks Run and which reveals some of Harrisonburg's better-hidden natural beauty. Along the Northend Greenway, this will create public park space in areas where there currently is little. The path will be 8 to 10 feet wide and entirely paved, with a buffer of green space on either side. At different points along the route, this green space will include native plantings, places to sit and rest or have a picnic, informational signs, and potentially stream and field restoration. The park will only be accessible to non-motorized traffic, and will be well-lit. Looking for a direct contact? It's Suzi Carter at suzi@northendgreenway.org or (540) 810-7667. Strong March, Slow April, Strong May. Will June home sales be strong or slow? March 2012 sales soared (66) to the highest levels in the previous three years. April 2012 sales were slower (73) not setting any new records. 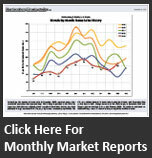 May 2012 sales soared (77) to tie for the highest level in the previous three years. So, what will June bring us? A slower pace, or stronger pace of sales? Thus far in June, there have been 46 home sales, compared to 47 in the same time period last year. Thus far in June, 69 properties have gone under contract, compared to 67 in the same time period last year. Perhaps June will be a predictable month, right on par with last June? Does Fannie Mae's prediction of a national home price bottom in 2013 affect us in Harrisonburg, Rockingham County? Home prices seem to be starting to increase again in Harrisonburg and Rockingham County (read more here) so what impact (or relevance) does this new report from Fannie Mae have on our local market? "Doug Duncan, chief economist for Fannie Mae, released a report saying growth for all of 2012 is expected to come in at roughly 2.2%." "And before Americans finish off the year, they will continue dealing with a reduction in hiring, potential issues stemming from the fiscal crisis in Europe and a potential drag on the U.S. economy during the remainder of the year." We have remarkably low unemployment rates locally, that are still declining. (read more here) Thus, any declines in national hiring seem unlikely to significantly affect us locally. And issues in Europe and with the general U.S. economy might peripherally affect us here locally, but our local economy has managed to remain relatively stable throughout the past five years despite significant negative impacts in many other parts of the country. "Main measures of home prices have firmed in recent months, as the share of distressed sales has declined in a strong seasonal period," he explained. "Despite this recent encouraging trend, the (research) group continues to expect that home prices on a national basis will show a slight additional decline before bottoming in the beginning of next year." I am guessing that we will not see an additional decline in home prices in 2012 and 2013 (as predicted above) for Harrisonburg and Rockingham County. I believe the 2012 median home price will be relatively similar to 2011 (+/- 1%). National housing market and economic news is important to monitor, but it is important to keep it in context and to pay even more attention to what is happening locally. After peaking at 408 lot sales in 2004, lot sales took a huge plunge down to recent annual sales levels around 60 lots. Median prices also skyrocketed up to $100K, but have settled down in recent years to a median of around $55K. Sales are a bit slower than expected thus far in 2012, with only 17 lot sales in the first five months of the year. The graph above represents lot sales reflected in the HRAR MLS of less than one acre. See a clearer version of this graph on Page 18 of this PDF. How do you market and sell a $750K+ home in Harrisonburg or Rockingham County? There are 17 homes on the market in Harrisonburg and Rockingham County priced over $750K -- view them here. How many of these impressive homes are likely to sell this year? Well, as it turns out, the high end home market ($750K+) is on fire in 2012 (with 1 sale thus far) as compared to 2011 when not a single home sold for more than $750K as reported by the HRAR MLS. Yes, you heard that right, not a single home over $750K sold during 2011 through the HRAR MLS. Which brings me back to the question at hand..... How do you market and sell a $750K+ home in Harrisonburg or Rockingham County? There are plenty of marketing strategies and techniques that can be employed (e-mail me and we'll discuss them) but the main point here is that a seller needs to set realistic expectations based on how large the pool of buyers is for their particular segment of the market. If nobody has bought a home like yours (based on price, size, location, whatever) during the past year --- what are you going to do in the marketing and pricing of your home to get different results? Don't do the same thing that other sellers have done for the past year and expect different results. As mentioned in the Daily News Record today, the number of homes for sale keeps declining. Current inventory levels are down 14% (see the graph above) from one year ago --- and down 25% from two years ago. SELLERS: Research (with your Realtor's help) inventory in your segment on the market (age, location, size, price). You need to know if your segment of the market is also experiencing declining inventory. Price, market and negotiate according to what you find. BUYERS: If you are attempting to buy in an under-supplied segment of the market, be ready to act fast when the right property comes along with home sellers who have priced the house to sell. WOULD-BE SELLERS: Research your segment on the market to see if you'll be listing your home in an over-supplied or under-supplied market. You might be positioned quite well to sell quickly --- or, you might be in for a long wait. Read more about the local housing market in my full monthly market report by clicking on the report cover below. As mentioned earlier this week, home prices may be ready to head back up. So, if you have been waiting to buy until you were confident about the future of the market --- now may be the OPTIMAL time to buy. This may be the lowest point for prices, with a brighter future ahead. These are likely the lowest interest rates we'll see in the next few years. These are likely the lowest home prices we'll see anytime in the near future. If you're on the fence as to buying, talk to your Realtor today about getting the ball moving forward on a purchase! And if you don't have a Realtor, I, of course, would be more than willing to assist you with your home purchase. Drop me a line at scott@HarrisonburgHousingToday.com or call me at 540-578-0102. Take a look at the past four months of contracts (356) --- marking a 6% increase over the same four months of 2011. With the pace of home sales up 6% over this time last year, and contracts up 6% over this time last year, we are likely to see a continuation of the strong 2012 local home sales market into and through the summer months. Are sales prices about to head back up? This is the first month we've seen this upward trend. Stay tuned for the next few months to see if we continue to see an upward trend in sales prices as we add more home sales to the 2012 median price figure. This is the value trend for SINGLE FAMILY HOMES --- not the overall market including townhouses, duplexes and condos. Single family homes showed an earlier recover in sales pace, so perhaps we will also see a price recovery here first as well. Home sales rose 13.24% in May 2012 as compared to last May. Year-to-date home sales rose 5.61% as compared to last year. The median sales price rose 18.75% (!) in May 2012 compared to May 2011. The YTD median sales price has increased 6.5% in the past year. A warm February lead to higher than normal March sales, followed by a slower than normal April, finished off most recently by the best May in three years. Inventory is down 14% from a year ago. Buyer activity in May was up 6% from last May. Single family homes are seeing an increase in median sales prices. Perhaps we will be down to 3.5% on a 30-year fixed rate mortgage soon? A new record was set yesterday, with an average rate of 3.67% for a 30-year fixed rate mortgage. Wow! I think modular housing is a great alternative to consider when looking at new housing, but there are several issues to consider when buying a modular home that are often overlooked. The modular housing industry often advertises a packaged home at avery attractive price. There are numerous costs to consider that add to the cost of the package, not to mention the upgrades offered on a modular. Excavation and sitework, well, septic, driveway, seeding and landscaping, foundation/basement costs and set up costs are often the same as they would be for a stick built home. My guess is that the market for the modular housing industry is a client that is looking for lower cost housing when in fact they could be building for the higher end market as well. There are several upgrade options that give an owner many of the same amenities that are available in a custom home. I have lived in a modular home and we have renovated modular homes. We have seen good construction and have witnessed poor construction practices in modulars. As is true in most cases, it is up to the contractor you are working with or your knowledge of construction and your ability to supervise the construction that will give you a good product. If you have clients looking at modulars or have clients who wish to be there own contractor, we would be happy to meet with them. The housing market is clearly changing and Herr & Co wants to continue to work with owners who like to be involved in the process. If you're considering a modular home, you may want to touch base with Jim Herr of Herr and Co. Building Contractors as a potential contractor for the construction of your modular home. Buying a house is not for everyone, but it's becoming more and more favorable compared to renting! From the Reuter's blog: Let's go buy a house! Just as with the housing market, the local news is often quite different than the national news, thank heavens!